We’re quite excited to share some big news! The Lakes of Fire Board and Leads have worked with our excellent hosts at Lucky Lake to add space to the event. Two more camping areas will be available this year in a new space north of Pines Road: the Chill Zone and the Quiet Zone. Interested? Check out the map and read more about what these spaces have to offer. If you feel so inclined, take the survey to tell us what you think. Parking and Unloading times will be enforced. DPW is asking everyone to honor the 2 hour time limit for unloading your vehicles when coming to camp. Car Camping this year is completely restricted to campers with a medical need. To car camp, you will need a Car Camping Permit from the Parking Department. There will be a tow truck this year. DPW will enforce their vehicle policy with it. They aren’t kidding. Vehicle owners will be billed for the tow. Check out the updated Survival Guide for all the details. Art grant submissions are open through February 17th at 1 AM EST! Complete your application and get a piece of the $35,000 set aside for the creation of art in 2019, including $500 for projects by kids. If you have an existing amazing large scale art project that you want to bring to Lakes of Fire and you need some assistance with transportation, repairs, or consumables like propane, complete the Art Honorarium Application and the Art Grants team will get back to you by or before March 1st, 2019. We’ve set aside $15,000 in 2019 to help bring your art to Lucky Lake! The Board of Directors for Great Lakes Experimental Arts (the organization that creates Lakes of Fire along with all of you) has made The Afterburn Report for 2018 is available, along with the 2018 Financial Statement. 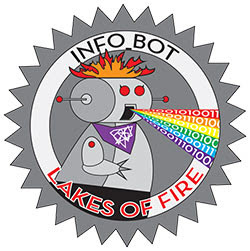 If you have any questions, please feel free to send them to board@lakesoffire.org. There are multiple changes coming to Lakes of Fire this year. We will continue to link to them in the New Policies section of each news blast as they are announced. Sign up now for the Lakes Letter if you want these updates in your inbox. Lottery registration began on February 2nd, 2019 and will remain open until February 23, 2019 (at 23:59:59 central time). We do not anticipate a fire sale this year. TICKETING – see the Ticketing Process Page. VOLUNTEERING – volunteer sign-up forms for 2019 will open on March 2nd, 2019. CAR CAMPING – no car camping without medical need; towing enforced. Whew! It’s been a busy few months here for the Lakes of Fire Leads. Everyone is gearing up for a huge year in 2019. As the new info_bot, I’m just enjoying the madness. (Probably up until I get tasered on Facebook.) See you soon!